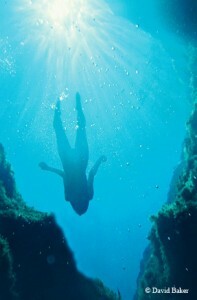 The mysterious power and irresistible draw of Jacob’s Well inspire a push to protect the underwater cave and springs. At first sight, Jacob’s Well appears to be a deep, dark hole at the bottom of a pool of creek water — nothing more. Pay attention to how the hole, about 15 feet in diameter, has perpetually gushed pure artesian water out of the ground since before humans first wandered around this part of what is now known as the Hill Country, and it takes on deeper meaning. Listen to stories about it, and it becomes something much more than just a special natural place. Local elders speak of leaping in as kids and being thrust back to the surface by the force of the flow. The location in the eastern Hill Country — the dry, rocky rise above the coastal prairie — makes it all the more remarkable. That a place like this exists in the 21st century, when half the springs documented in Texas in 1900 have gone dry and disappeared, is a miracle. At least that’s how it seems whenever I’m gazing into the blue and green hues tinting the water and the limestone walls of what is the beginning of a giant underwater cave. Everything sparkles like magic, a phantasmagorical welcome to another world below. Peer into its depths and it pulls you in. That pretty much sums up David Baker’s life since May 1988. He had been in Austin working as a designer and carpenter on a theatrical production when he took a drive with his wife to the village of Wimberley, got directions, walked down a trail to the end of a limestone bluff and saw Jacob’s Well for the first time. In a matter of months, Baker left a mountaintop home near Santa Cruz, Calif., in the redwoods, where on a clear day you could see the Pacific and the town of Monterey. He packed up his pregnant wife and his 9-month-old son, Jacob, and moved into a rock cottage a few short steps away from Jacob’s Well. The sign in front of a former RV park reads “Welcome to Jacob’s Well Natural Area, the Jewel of the Hill Country.” A couple hundred yards past the sign, David Baker sits at a desk, typing at a computer, preparing a paper to protect the well he fell in love with. Baker’s office is neither bucolic nor picturesque, but rather chaotic. Baker fields calls, refers to charts and converses in geologist/hydrologist acronyms, citing DFCs (desired future conditions), ADRs, MAGs and GAMs as he talks about the Well’s past, present and future. Baker toils in the trenches these days, working his way through a very thorny political process, having been schooled in contrarian water laws. Texas treats surface water such as lakes and streams as a common resource owned by all Texans, while groundwater such as Jacob’s Well is considered private property. The “rule of capture” states that the owner of surface property owns the water underground as long as it is not part of a subterranean stream. Baker was in the minority voting bloc when the board of directors of the Hays Trinity Groundwater Conservation District, an entity he was instrumental in establishing, voted earlier this year to issue new pumping permits for a development and a golf course that Baker fears will hasten the Well’s demise. There is already an annual decline of two feet under current conditions, Baker pointed out during discussions before the vote. Board President Jimmy Skipton, a developer and property rights advocate from Henly, responded, “That’s David’s opinion.” As an individual, Skipton has filed a lawsuit against Hays County for establishing development rules that require lot sizes to be at least six acres for homes dependent on individual water wells. Skipton wants to sell 1.5-acre lots on the 165 acres he would like to develop. David Baker wants Jacob’s Well to continue being Jacob’s Well. For natural places to remain natural, stewards like David Baker are required. Special places lack lobbyists, money to contribute to politicians and the legal tools to fend off forces that compromise their integrity and threaten their existence. The best hopes are advocates willing to devote time, money and research in order to preserve, protect and conserve places such as Jacob’s Well. In the big picture of earth science, karst aquifers are rare and unique — spongy-looking hard limestone reservoirs hundreds of feet below the surface that filter water, hold water and produce water, pushing it above ground, as is the case of Jacob’s Well. 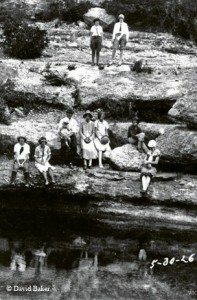 The Well feeds Cypress Creek and Blue Hole, the town park and swimming hole in Wimberley, before the water flows into the Blanco River about five miles downstream. The creek courses through scenic landscapes of twisted oak and gnarly scrub woodlands and abundant grasslands, bordered by high bluffs and hills beyond the drainage. The beauty is both surreal and exceptional. Endangered golden-cheeked warblers thrive in abundance here. 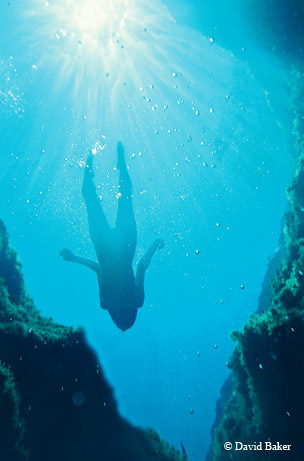 My introduction to Jacob’s Well came through Stephen Harrigan’s 1980 article for Texas Monthly magazine and his 1984 novel, Jacob’s Well, in which he tells the story of the Well and its attraction to scuba divers, and how several cave divers died in its chambers. I came away wondering what kind of place exerted that sort of fatal attraction. 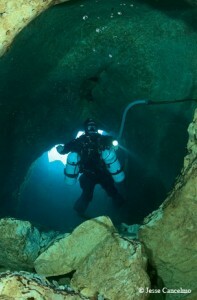 Between 1960 and 1985, eight divers died in the Well, primarily because of the tight passageway between the third and fourth chamber, the quicksand-like sediment at the bottom of the third chamber that is easily stirred up and narcosis, a condition of confusion that can affect divers at depths greater than 100 feet. Don Dibble, a master scuba instructor and the owner of the Dive Shop in nearby San Marcos who almost lost his own life on a recovery dive on behalf of the San Marcos Area Recovery Team, wrote his own account of the Well’s allure for divers for Reader’s Digest. 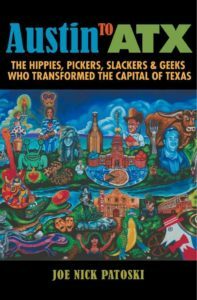 I didn’t actually see the Well until the early 1990s after I moved into the Wimberley community and was invited to a festival at Baker’s Dancing Waters Inn. When I finally saw it, I got it. Of the proverbial 1,100 springs that define the Texas Hill Country, this one was indeed special, exceptional and worth fighting for. In 1996, Baker got serious about protecting Jacob’s Well when Wimberley residents began meeting to discuss formally incorporating the village. Baker was on the water and sewer committee. One consensus recommendation from the committee was the need to form a nonprofit land trust and water trust in the Wimberley Valley to ensure water quality and quantity, a critical element of Wimberley’s tourist economy. Working with Jack Hollon, whose family had donated ranchland to create Rancho El Cima for the Boy Scouts of Houston and who had seen the Blanco River go dry in the 1950s, landowner Johanna Smith, University of Texas history professor Patrick Cox and physician-nutritionist Dr. Philip Zyblot, Baker helped form the Wimberley Valley Watershed Association in December 1996. 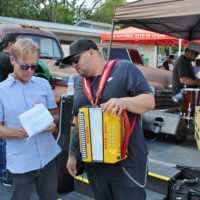 The nonprofit organization began writing small grants and engaging in water quality monitoring, participating in the Texas Watch program. It also focused on ownership of Jacob’s Well, which had been divided into four major pieces, with more than 120 parcels in the 100-acre area around it. In 2005, with financial help from the Save Our Springs Alliance in Austin, the group got a loan for $2 million to purchase 46 acres, including 100 percent of the well. The selling price was about $1.1 million less than the appraised price. The SOS Alliance put a conservation easement on most of the property to prohibit future development and to limit impervious cover such as asphalt and concrete to 6 percent. The Wimberley group had two years to pay back the loan. In 2007, 69 percent of Hays County voters approved $30 million in bonds for open space. The Wimberley Valley Watershed Association hired the Lady Bird Johnson Wildflower Center and architects Lake/Flato to create a master plan with input from 30 residents. The group determined that environmental education, aquifer research and recreation were the top priorities. The patchwork of acquisitions was completed in late December 2010 when developers of the mobile home park canceled plans to build a “green” development with 65 condominiums and a hotel on 15 acres adjacent to the Well and dropped a lawsuit against the Wimberley Valley Watershed Association over access issues and the perceived right to build a road through the property. Instead, the developers agreed to sell the land for $1.7 million. Hays County ponied up half the price and the Texas Nature Conservancy loaned the other half, citing the unique attributes and ecological significance of Jacob’s Well. Humpty-Dumpty has been put back together again. Today, Hays County owns Jacob’s Well and 96 acres around it. The Wimberley Valley Watershed Association has a three-year contract with the county to manage the property and oversee education and public outreach. Slowly but surely, the surrounding landscape is returning to its natural state. Through better understanding of how the land and water are interconnected deep underground, people are beginning to appreciate the critical role we play in this system and how easily we can disrupt the balance that has made nature’s abundance such a critical key to human growth and progress. The “rule of capture” property right accepts the Texas Supreme Court’s judgment made in 1908 that groundwater is too “mysterious and occult” to regulate like a river, lake or stream. Looking down into Jacob’s Well, I can understand the judges making that sort of determination. But our understanding of groundwater has improved considerably over the past century. We know how it works, how it moves, where it starts and where it stops. 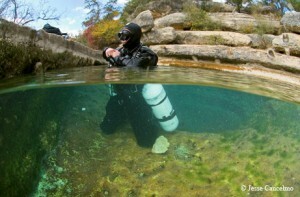 Through Baker’s initiatives, scuba divers and dye tests, we know that Jacob’s Well is connected to the Edwards Aquifer near San Antonio and to Barton Springs in Austin, that the actual well is at least 5,550 feet long as mapped by divers for the United States Geological Survey (the first- or second-longest underwater cave in Texas, depending on the latest measurements of Phantom Cave near San Solomon Springs in West Texas), that the water emerges from the Cow Creek Limestone formation and that pumping from some of the larger of the 6,600 wells in western Hays County reduces the flow of Jacob’s Well. The Well stopped flowing twice — in the summer of 2000 for the first time ever and during the drought of 2008 when 42 wells in the county and nearby Onion Creek went dry. The Well survived the historic drought of the 1950s but may not be able to endure the population boom in Hays County and the surrounding Hill Country. Education is the best hope. He acknowledges he’s in a race against competing interests and that the deck may be stacked against him. I’m not sure who walked away happier from the visit — the hikers or Baker. And now they come — to see, to study, to experience and even to jump in. If Baker gets enough people to do that, they just might save Jacob’s Well for this century and even beyond. The sweetest pleasure of a Texas summer is the swimming hole. You can have your Colorado mountains, your slices of watermelon and your gallons of iced tea. You may prefer passing as many of your waking hours in climates far away from here or in climate-controlled comfort 24/7, courtesy of 50,000 BTUs of refrigerated air and driving with the windows up and the MAX A/C control cranked to high. You can whine all you want about how hot it is. I immerse. With a swimming hole, anyone can fade the heat. Which is why I can say with a straight face that my favorite time of year is right now, when these endless strings of broiling days and sweltering nights that wear down the human spirit and sap the want-to and can-do in even the hardiest of souls plod onward to the middle of September. I will survive. In the hole. Oh, I’ll tolerate a swimming pool in a pinch. But whenever I do, I’m reminded why Jed Clampett and family called pools “cement ponds”: It ain’t natural. The chemical scent and sting of chlorine negate any sensations of being cradled in the bosom of Mother Nature. Doing laps in a pool is like getting stuck in rush hour traffic on Stemmons: All I can do is stay in my lane and hope I don’t lose count of the number of laps I have to do before I’m done. Charting my own course across a swimming hole is more like a meandering Sunday drive on a remote Farm to Market Road. With songbirds, the splish and splash of water, laughs, giggles and the occasional shout of “Marco Polo” providing the soundtrack, you can leave the modern world behind for a little while. Swimming holes have worked as an effective antidote to Texas’ excessive heat for several millennia. Archeological evidence indicates San Marcos Springs in San Marcos – Aquarena – has been continuously occupied for at least 12,000 years, The area near Del Rio where the Rio Grande, and the Pecos and Devil’s rivers converge is pocked with caves overlooking springs, creeks and rivers containing more examples of Indian rock art than anywhere in North America. Swimming holes are just as inspirational now, and Norman Rockwell and Thomas Eakins and Austin artists Jimmy Jalapeeno and Malou Flato aren’t the only ones who’ve seen the eternal beauty in them. A good swimming hole is church. Splashing in water that is clean and clear and surrounded by tall, stately shade trees with at least one big rock to lay out on and jump off of, and a rope swing hanging from a limb is compelling evidence there’s a higher power. Great holes stretch from the Piney Woods near Texarkana to the Chihuahuan Desert of Far West Texas, some wild and natural, others tamed and civilized. All of them promise a place in which one can cool off, cool down and cultivate the lazy streak that resides within us all. The Hill Country is exceptionally blessed. 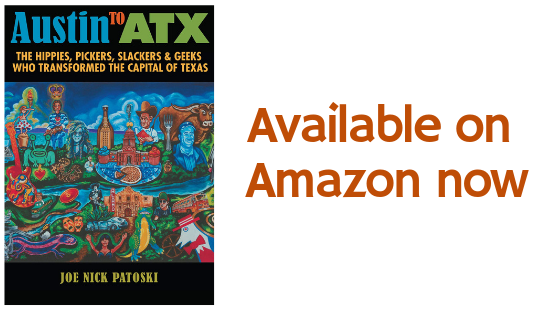 The state’s greatest concentration of swimming holes on creeks and rivers fed by artesian springs are found within a couple hours of San Antonio and Austin, most with hard limestone bottoms that eliminate the “goosh” factor on your feet and towering bald cypresses at waters edge. I must have had water in my ears because I swore Mad Eddie and his pitchwomen were talking about swimming holes, not oil wells. It took two years of coaxing from my wife and adjusting to the chilly waters of Barton Springs in Austin to get hooked on swimming-hole swimming. After writing about swimming holes on numerous occasions, discovering new holes almost everywhere I looked and futilely fighting the good fight to preserve Barton Springs against a tide of development upstream, I finally moved to the Hill Country specifically to have a swimming hole I could call my own. Some people live where they live to be close to work, for the schools, for the neighborhoods. I live where I live for the swimming hole. It’s like I told the mother of a playmate of my son’s, when she asked if I’d moved for the schools or the kids – I moved for me. A happy dad can influence an entire family, I reasoned. My wife has certainly seen a difference. My younger son learned to swim in the swimming hole. Now 13, he’s been honing his stone-skipping skill at the swimming hole lately, designating one exposed boulder as the “skipping rock” and an adjacent boulder as the “waiting rock,” proving there’s still plenty of kid in his growing teenage body. My sister tells me the secret swimming hole I took her to not too long ago was the highlight of a weekend that also included a chichi party at The Mansion on Turtle Creek and a movie premiere in Austin. My brother-in-law reports the experience made him feel “giddy” and reminded him of his Arkansas boyhood. My swimming hole isn’t really mine. I just bought legal access. And to be honest, it’s no rival to Balmorhea Springs in West Texas. But it’s clean enough to attract squadrons of dragonflies and to test better than my well water, and clear enough for visitors to be able to see minnows, perch, bass, catfish, carp and turtles in their element through the goggles, which is enough to make me feel proprietary. Lord knows, I pick up enough trash around it that some litterbugs think I act as if I own it. During warm weather months, my calendar revolves around my swimming hole. From early spring until late fall, I swim laps in my swimming hole almost every day. During the heat of the summer, two-a-days and sometimes three-a-days are not unusual. Morning swims are a better wake-up jolt than two cups of coffee. There have been evening swims at dusk while surrounded by fireflies twinkling under the cypresses and bats fluttering overhead accompanied by the croaking chorus of frogs that have brought me as close to nirvana as I think I’ll get on this earth. Moonlight swims can be both romantic and spooky. The end-of-swimming-season swims are tests of endurance, requiring a swim cap and considerable intestinal fortitude. Swimming after floods is not a good idea due to dirty runoff and the fact that snakes can’t see you any better than you can see snakes in murky water. A New Year’s Day plunge has become a small ritual, but nuts nonetheless. Last month, I went back to Burger’s Lake on the far west side of Fort Worth, site of my first natural swimming experience. Not quite 50 years later, I was pleased to see nothing much had changed. The petrified wood cottage and the little rock building under the pecans and sycamores at the entrance still beckon like an elf’s sentry at the gates to an enchanted forest. The high diving boards at one end and the diving platform near the jet fountain in the middle of the lake were still crowded with kids. The line to the trapeze swing was just as long as I remembered. Obviously, I wasn’t the only kid who liked the cheap thrill of swinging out, then into the water. Lifeguards patrolled the lake in rowboats same as ever. I didn’t recall the chlorine in the water, but times have changed, I guess. What has not changed is that hundreds of people are willing to pay for the sweet relief of cooling off in the water. I couldn’t help but wonder if at least one of those visitors I saw at the lake will someday want a swimming hole of his or her own, too. A small sampling of Joe Nick Patoski’s favorite swimming holes across the state. A springs fanatic picks his 10 favorites (plus a few honorable mentions). Of all the features that define natural Texas, nothing speaks to the soul quite like springs do. As the source of water in its purest, most pristine form, springs are the basic building block of life. They present themselves in a manner as miraculous as birth itself, gestating in the womblike darkness of an aquifer deep underground until pressure percolates, pushes, and forces the water up through cracks, fissures, and faults in the limestone cap until it bubbles, seeps or sometimes even gushes, to the surface, magically turning everything around it lush and green. Springs feed creeks, streams and rivers, and nourish plant and animal life. Springs are why Texas has been inhabited for tens of thousands of years. As far as I’m concerned, though, the greatest thing about springs is that they create swimming holes, which are the very best place to be in Texas in the summer. The greatest concentration are clustered in the Hill Country, where human activity around San Marcos Springs, the second largest springs in Texas, has been traced back more than 12,000 years. Like me, the ancients must have figured out that immersing in cool artesian spring water was a pretty smart way to survive a hot day in August. I endure the heat gladly when I’m close to a spring-fed swimming hole. The endless string of broiling days and sweltering nights that wear down the spirit and sap the want-to and can-do in even the hardiest of souls — that’s my favorite time of the year. Springs are why. The great spring-fed swimming holes of Texas run the gamut from wild and unsullied to tamed and civilized. All of them promise a shady place to cool off, cool down and cultivate the lazy streak that resides within us all. The swimming hole is my church, a holy place to splash in water clean and clear enough not to have to worry, with at least one big rock to lie out on and jump off of, and ideally a rope swing hanging from a tree limb. Settings like that are compelling evidence there is a higher power. I have written about swimming holes on numerous occasions for several publications. I live where I live for the swimming hole, which all of my family enjoys in the summer. I plan road trips around swimming holes. I’m always on the prowl to find new ones. There are literally hundreds of these liquid jewels scattered across Texas, many of them known, some secret, all defying the logic of geography, geology, climate and progress. Without springs, I would not be here. Without springs, I don’t think Texas would be here, either. Having to select my 10 favorite swimming holes is not unlike having to choose among your children, knowing I’m leaving out sweet spots like Mankin’s Crossing on the San Gabriel, Tonkawa Falls in Crawford, the state parks at Colorado Bend, McKinney Falls, and on the Guadalupe River near Boerne, the entire Medina River, Burger’s Lake in Fort Worth, the Paluxy River in Glen Rose, Possum Kingdom Lake west of Mineral Wells, Tule Canyon Lake near Silverton, Chain-O-Lakes near Cleveland, Hancock Springs in Lampasas, Las Moras Springs at Fort Clark in Brackettville, the Slab in Llano and the 7A Crossing in Wimberley, just to name a few. The following 10 are chosen at my own personal peril and risk, because they’re just my opinion. You likely have your own top 10. Either way, we should all quit arguing and jump in, feet first, eyes closed. Biggest cannonball splash wins. 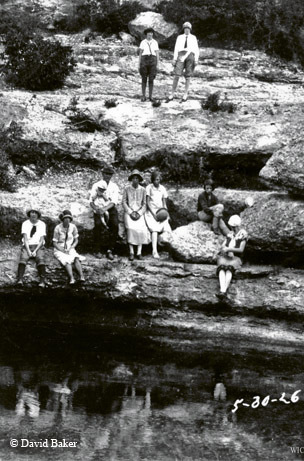 Back in the 1930s the Civilian Conservation Corps lined the banks of San Solomon Springs, the biggest springs in West Texas, with native stone and built a classic bathhouse to provide easier access to 78-degree water that is Caribbean-clear and brimming with pupfish, tetras, catfish and turtles. Those features and its picturesque location in the Chihuahuan Desert with the Davis Mountains on the horizon conspire to create the finest natural swimming experience on earth. As development has sprawled beyond the pool and the creek upstream all the way to its headwaters some 30 miles away in Hays County, Barton Springs is more remarkable than ever. There are times when the water is so clear it’s as if nothing has changed in the last 100 years. I derive a great deal of pleasure watching friends get hooked the same way I did at Barton’s more than 30 years ago. Two recent converts I know begin their day at 5 a.m. in the springs, with downtown skyscrapers and the moon providing all the illumination they need to navigate the dark waters. That’s a little too extreme for me, but they know like I know there is no better urban swimming hole on Earth. Period. The 1.5 million-gallon, spring-fed pool at the Landa Park Aquatic Complex on the Comal River in New Braunfels is a compact version of Barton Springs without the crowds, fed by the biggest springs in Texas. A few hundred yards downstream on the Comal River is the Prince Solms Tube Chute, a cheap thrill ride that inspired the nearby Schlitterbahn, consistently rated as the best waterpark in America. Thanks to the constant 73-degree water temperature, snorkelers and divers can do the entire mile-long stretch of the river year-round. This sublimely picturesque natural swimming environment consists of several pools on Little Cypress Creek, fed by a small waterfall tumbling from springs on the exquisitely manicured bluff above. Krause Springs is privately owned, but overnight camping is permitted. (830) 693-4181. The San Marcos River begins at the bottom of Spring Lake, an impoundment where the second biggest complex of springs in Texas pumps out thousands of gallons of pure water, spilling over two small dams before winding swift, crystal-clear and cool (70 degrees year-round) on a short, two-mile run as a semi-tropical waterway ideal for tubing, snorkeling or wading. The flow in some spots is so strong, you can point upstream and swim in place, getting a good workout among the turtles and fishes in the wild rice without going anywhere. There’s even a small dam to slide down to keep things interesting. Sewell Park (on Texas State University Campus): (512) 245-2004. This storied hole on Highway 39 was popular long before Hunt became a favorite Hill Country destination for wealthy families from Houston and San Antonio in the early 20th century. Thirty miles southwest of downtown Austin, Hamilton Creek transforms into a 50-foot waterfall that tumbles into a steep canyon shaded by a near-perfect cave overhang with a nice sandy beach at the opposite end of the natural pool. Access to this idyllic grotto is limited. The red granite cliff, a Highland Lakes landmark, is rife with small falls fed by Spring Creek following heavy rains and offers a 25-foot promontory from which to jump (feet first, of course) into this dammed portion of the Colorado River. This swimming hole on San Felipe Creek in the small city-owned Horseshoe Park is a welcome oasis on the edge of the desert, even though busy Highway 90 crosses nearby. Flanked by improved banks of native stone, shaded by stately pecan, elm, maple and mulberry trees, lined with a hard limestone bottom, and fed by the fourth largest springs in Texas, the pool is shallow enough near the banks for kids to stand in and long enough to swim short laps. This storied hole should bust back into the Top Ten next year when it reopens as a city park. The hole is in the process of being purchased by the Village of Wimberley, aided in no small part by a $1.9 million grant from the Texas Parks and Wildlife Department after being saved from development by local resident Peter Way.